I like my "Palm powered" Fossil Wrist PDA. The short battery life was my main annoyance for using this wearable computer. Originally in April of 2005 I thought of using external NiMH batteries by powering the unit through the mini USB/power connector. It seemed too bulky so I gave up for a while. Near the end of 2005 my Fossil was only lasting 1-2 days with almost no use, which was annoying as hell. This time I looked for low cost battery to replace the Lithium battery built into the unit. I discovered a plastic encased Lithum-polymer battery that fit nicely under the unit, adding about 1/4 inch to the height. At 550 mAH it has about 3 times the rated capacity of the original Fossil battery. This modification should work with all similar models of Fossil and "Abacus by Fossil" Wrist PDA with Palm OS. This includes the Fossil FX2008, FX2009, Fossil Abacus AU5005, AU5006, AU5007, AU5008 and similar. Here is a table to show the expected battery life if the batteries worked as rated. Actual life depends on how much you do each activity on the table. One real life observation is that both my original Fossil, and my newer Fossil Abacus, never lasted as long as battery ratings suggest! I believe that up to half the battery life may be killed at the start. This is because if you store the PDA it drains the battery to near death. In addition deep cycles can also shorten the battery life. The current measurements were on my unit. Variations between units may give different results. Also remember that this table is based on typical brand new batteries, freshly made. You might only see 2/3 the capacity in a "new" battery when received. Your body heat while wearing the wrist PDA and air temperature may also affect battery life. * note- The measurements for entering memos was made at a fast pace for both the keyboard screen ( / then ABC from Jot) and handwriting recognition (Jot). If in input mode but not entering then the current is about 7 milliamps. Warning: The following modification could damage your unit or start a fire. The Lithium battery is "live" while being removed or replaced so it is possible to short the leads, short-circuiting the battery! Someone experienced with electronics could still make a mistake. If it is attempted then do it in a location where fire and smoke will not be harmful. a. Measuring and drilling holes: The first step was to measure a position for the connector on the backplate. 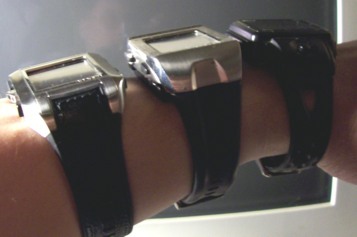 The connector was put on the lower part of the watch so that the positive and negative leads would line up with the internal positive and negative. (I did not want the wires crossing inside the unit, room is tight as it is. Instead of drilling out a complete rectangular hole, the long sides were drilled out then the middle - like a sideways letter H. This was done so the the uncut tabs formed by the "H" could be bent back to help hold the connector on the sides. Holes were also drilled on the speaker edge to help let the sound out more (it is the area with the green plastic in the photo). A few holes were also drilled along the sides for battery attachment. A layer of green plastic wrap was glued over the holes drilled for the sound. It is to keep dirt out. c. Removing the old battery and attaching the new: To remove the old battery the negative lead then the positive were heated and pulled from the board. Warning: Connecting the battery in the following step puts the voltage on the connecting wires. They must be prevented from shorting out, or it could damage the battery possibly starting a fire. Contact cement was placed on the back cover and the battery, then they were carefully lined up on the connector leads. Epoxy was then used along the edges of the battery and back plate to create a stronger attachment. One advantage of attaching the battery this way is that there are no wires to short out if the battery gets knocked off the back cover. Notice that the unused contacts on the lower edge of the battery can be used to measure the battery voltage. d. Soldering the battery wires to the board: Without letting the wires touch, they are soldered to the circuit board as shown in the following photo. To be safe I put electrical tape over the connector. Once the battery wires are connected, they can be folded into the case as the back cover is closed. Fossil Abacus, Fossil with external battery, and OnHand wearable PDA. Next see Upgrading the sound - After doing the battery upgrade the sound was even weaker, so a better piezo speaker was necessary. The new piezoelectric element was installed on the back of the new battery pack. For political interest, see Senator Mike DeWine's mental illness problem. © Copyright 2016 - Michael Lake - Make copies for personal use only.